Q: "Who are you and why should I read this guide?" A: I'm an AI War veteran and play exclusively on 10/10 difficulty level and am able to win games consistently. At the moment I've played AI War for 2433 2592 2752 hours so I know how the game works. When I first started playing I had pretty much everything enabled because I didn't know what everything does. That eneded up making things too hard so eventually I disabled most of the stuff. Expansions were still enabled. The first time I won a game was vs 6 difficulty Feeding Parasite and 6 difficulty Vanilla. -Easy AIs: Cowardly, Fortress Baron, Mine Enthusiast, The Tank, Vanilla. -Moderate AIs: Experimentalist, Neinzul Youngster. Map seed: Whatever you want. Some maps look a bit messy but you can use the "Untangle Map/Stop Untangling" button to make the map easily readable. All enabled EXCEPT: Swallowers, Fast Drones and Dire Guardian Lairs. You can enable CSGs if you want. 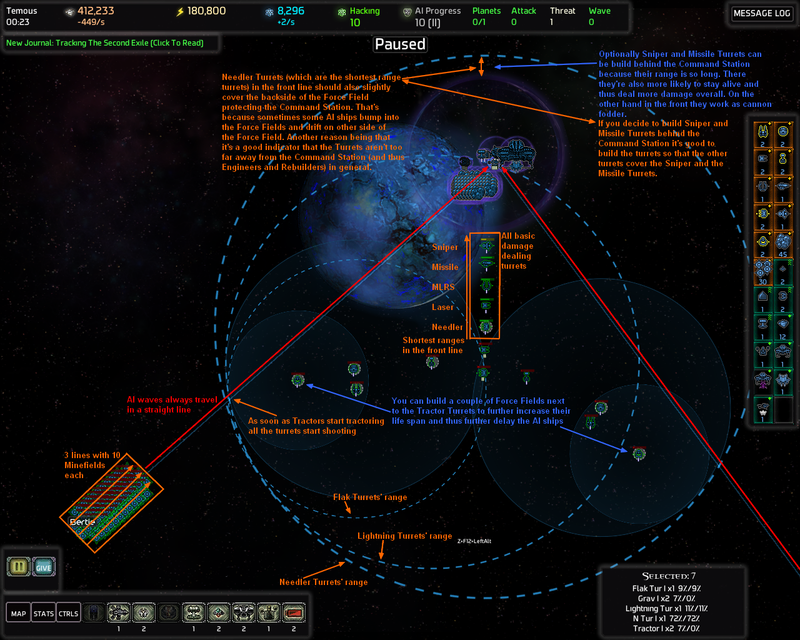 I recommend having CSGs on, just because they really focus you on completing objectives which will naturally get you ready to take out the AI homeworlds. Without them, it's pretty easy for a beginner to find the mid-game gets a little directionless. -Neinzul Rocketry Corps: Disabled (Besides Golems, Spirecraft and Champions Warheads are the only super weapons the player has. Neinzul Rocketry Corps send those same warheads at you when alerted. Note that Broken Golems Hard, Botnet Golem Hard and Spirecraft Hard will cause the AIs to send Exogalactic Strike Forces which are very powerful. If you feel lucky you can enable one Hard. Enable one Hard at most. -Beachheads: Disabled / Disabled (These things are very nasty. They will knock out your Turrets and Force Fields and they have a built in black hole machine which prevents your ships from leaving the planet until your have destroyed them. So you just started a new game. The first thing you should do is PAUSE. Then check the key bindings and In-game Controls. Key bindings can be found in: ESC--->View Controls or ESC-->Settings-->View Controls but the first one is faster of course. You can access the In-Game Controls by pressing the "CTRLS" button in bottom left corner. Mouse over the settings and read the descriptions. You should always use Auto-kite behavior. Set it to anything between 0 and 1000. Auto kiting range should be shorter than the range of any of your ships. Just set it to 1000 and all of your ships will auto kite. This will reduce the amount of enemy fire they take. I've set the "Engineers Do Not Assist Large Projects" value to 451 because Mark III Engineers cost 450 metal per second which is one of the highest build rates in the game.. but it still doesn't ruin your economy. So with the value set to 451 Engineers will auto assist Mark III Engineers and pretty much everything else. Except very expensive things like Golems or stuff from the Zenith Traders. New players might want to enable "Auto-FRD Engineers" and "Auto-FRD Rebuilders" to reduce the amount of micro needed. "FRD" means "Free-Roaming-Defender". 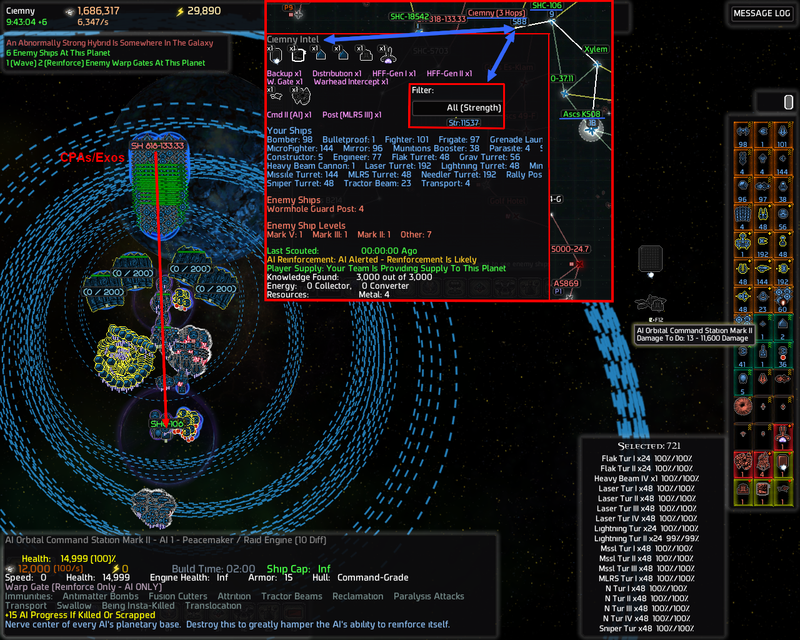 Ships that are on FRD mode are shown with red borders. It means they will go after and attack any AI ships or structures in that same planet. Excluding most Astro Trains and AI structures that cost AIP on death. I have these FRD optoins disabled because Engineers and Rebuilders have a bad habit of getting killed when the AI attacks. Having it disabled also allows me to rebuild and repair destroyed and damaged Turrets and Force Fields in the middle of combat which greatly increases the effectiveness of my defenses. Rebuilding and repairing Turrets in middle of a combat is almost like having more Turrets. The downside is having to manually order the Rebuilders and Engineers to repair the defenses after the fights. I use Scout Starships mostly for decloaking invisible AI units. Brave Cloakers is disabled because I use them exclusively to protect Warheads which always move separately from my fleet. Most of the options are self-explanatory. -Holding Alt while placing buildings or addings ships to queue adds 10 at a time. Right click to remove 10 at a time from the queue. -Holding Ctrl while placing buildings or addings ships to queue adds 5 at a time. Right click to remove 5 at a time from the queue. 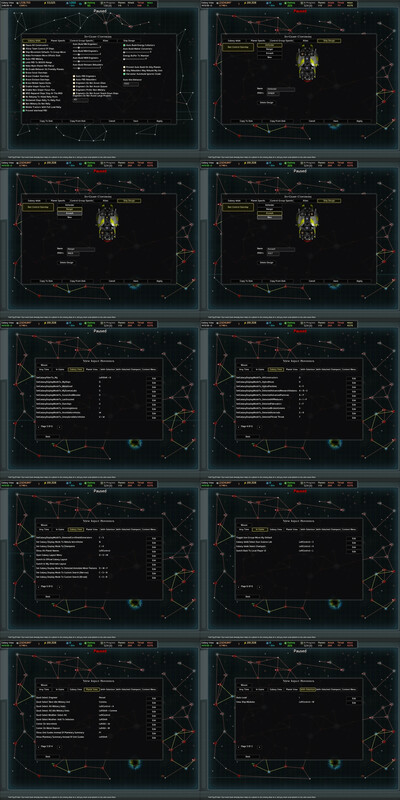 -Pressing L halves the amount of ships you have selected. -Pressing Shift+L selects 1/3 of the selected ships. -Pressing D scrolls trough the constructors on the current planet. -Pressing S selects the next Science Lab in the current planet. -Pressing Ctrl+S selects the next Science Lab in the whole galaxy. No matter which planet you're viewing. -Pressing B selects the Command Station on the current planet. -Pressing F1 scrolls trough the "in-game wiki" of all ships and structures. Press Shift+F1 to return to the planetary summary or just scroll trough. -Double click a target to select that specific Mark level of that specific ship type. -Triple click a target to select all Mark levels of that specific ship type. -Hold Shift to add to selection and hold Alt to exclude from selection. -Ctrl+left click on a wormhole to view that planet. -Normally when you select stuff by dragging the mouse while holding the left mouse button you only select military ships. Hold Ctrl to select everything. I really like Turrets and defenses in general.. strong defenses. If you have defenses strong enough to "auto stop" waves then you don't have to worry about anything. Although your fleet wont be as strong as it probably would be if you didn't invest so heavily in defenses you can still use it for surgical strikes which most of the time is enough. By surgical strikes I mean attacking 2 or more hops away with Assault Transports and taking out an important target like an AI Command Station, AIP reducer or Raid Engine. So.. as soon as a new game starts.. pause. You should have setup your controls now^^ so now you should start working on your defenses and deflecting those first AI waves. You should always build full caps of all available Turrets on all planets. Most of the time there's no reason not to. Building all turrets at once right in the beginning of the game will wreck your economy for a while so in that case you might have to sit around and wait for the Turrets to build. They will finish before the first wave arrives though so you should be safe. If you don't want to sit around waiting for the turrets to build you can start by building 20 of each Turret with a cap of 48. Since you're not building so many Turrets you can also start building ships right away. It may not be a good idea to build Starships right away because they're so expensive and cost quite lot of energy. This is how the Turrets should be positioned for maximum effectiveness. Here's a late game example of one of my whipping boys (Whipping boy=a planet that's heavily fortified and takes all/some of the waves). The setup is pretty much the same as the one above. A couple of small tweaks. Do not build turrets or Force Fields on top of wormholes.. it's useless. They really don't do anything there because the AI isn't "interested" in the turrets or the wormholes.. the AI is "interested" in destroying your Command Stations and ultimately your Home Command Station. So you need to protect them. Here's a trick that can help you place Turrets properly. Move ships next to your Command Station and pause the game. Then order them to go trough wormholes. Now start placing Turrets while holding Alt. You will see the paths the AI Waves will take when they attack because they always travel in straight lines. So now you can place the Turrets so their range covers those paths. EDIT 12.12.2018: Firstly here's a link to an old thread discussing about ships that synergize well together: Ship combos. Using these ship combinations is very powerful and can have a game changing effect. I had forgotten to add this information here so here it is now. Better late than never I guess. Tractor and Gravitational Turrets are really tanky so they will last quite long even when there's a couple of thousand AI ships. Turrets also have "Turret" hull type which is not countered by many ships. So the Turret hull type combined with their high health makes them really tanky and worth the knowledge, metal and energy cost. -10 Mark I Tractor Turrets stop 310 ships. -10 Mark II Tractor Turrets stop 750 ships. -10 Mark III Tractor Turrets stop 1500 ship. AI waves always travel in a straight line so they will bump into the Tractor and Gravitational Turrets. This is also why I strongly recommend unlocking Area Minefields before wave sizes get to about 700-900 ships. 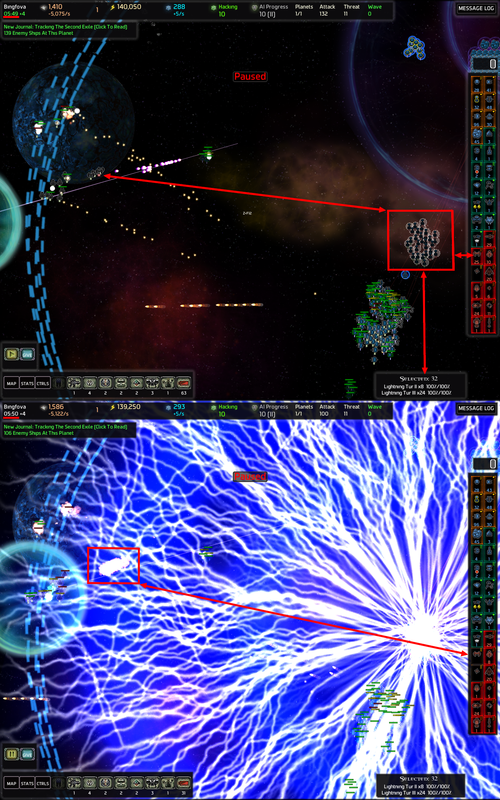 Use the line placing tool to line place the Minefields between the hostile wormholes and the Command Station. (Alt+Right click on the background-->line placing-->enable packed line. Make a line by first clicking on point A then B. Then hold shift and start placing). 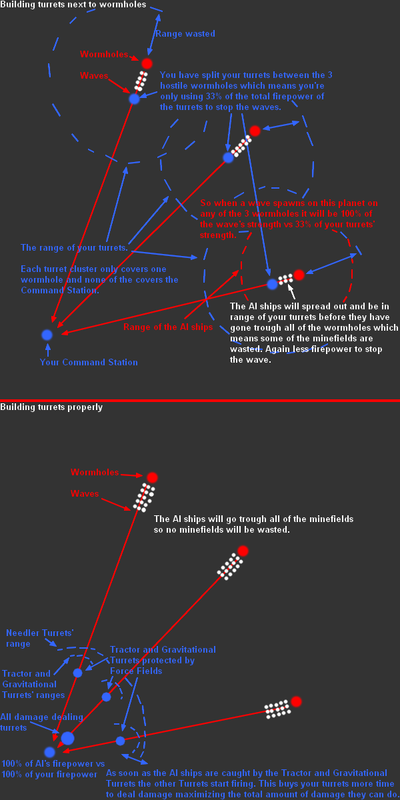 For Area Minefields to really have a noticeable effect you should place 3 lines of 10 Area Minefields per hostile wormhole. So 30 Area Minefields per hostile wormhole. They alone will destroy hundreds of ships. In addition to this you can add a couple of Force Fields on top of the Tractor and Gravitational Turrets to further increase their life span. Majority of the Force Fields still should be protecting the Command Stations because the AI usually prioritizes Command Stations over Turrets and Ships. So a cap of Mark I Bombers destroys a Mark I Force Field in 4 reloads which is 48 seconds. However if you're using Champions, Mod Forts and such and you're going to use the Force Field Modules then you should go for the normal Force Fields. When you unlock a higher mark level tech an equivalent module is also unlocked. Force Field Modules are based on the normal Force Fields so there's that. So Tractor and Gravitational Turrets protected by Force Fields should buy the damage dealing Turrets enough time to whittle down the AI attack so that they won't be able to drill trough the Force Fields protecting the Command Station. You can also build Flak and Lightning Turrets next to the Tractor and Gravitational Turrets (under the Force Field(s)). 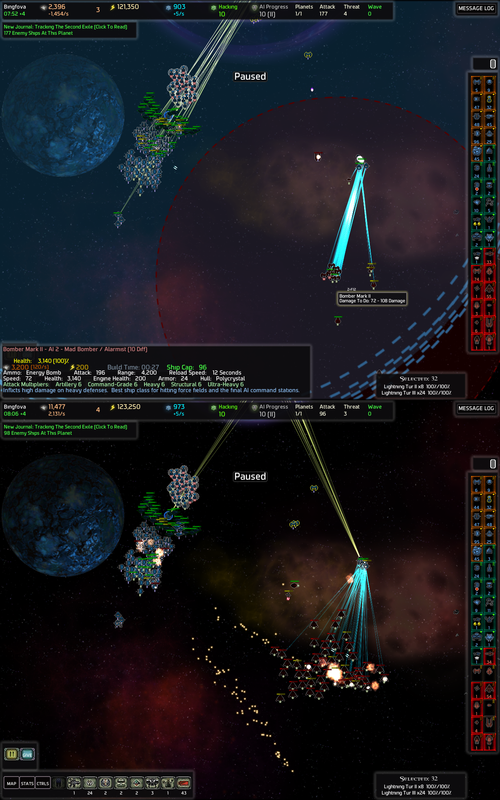 Usually you shouldn't build Turrets under a Force Field because the Force Field reduces their damage by 75%. Flak and Lightning Turrets are an exception. Force Field reduces their damage by only 25% so they still keep majority of their DPS. Flak, Lightning and Tractor Turrets protected by Force Fields work extremely well. It's a very effective combo. The fourth one would be either Heavy Beam Cannons (fourth one only because of their Knowledge cost) or Sniper Turrets. Heavy Beam Cannons are an excellent choice too. Their Knowledge cost being the only downside. Unlocking Mark IV Heavy Beam Cannons costs 9000 Knowledge but on the other hand they don't use much energy so their upkeep cost is quite low. They're also quite tanky and do a lot of damage vs all targets since they don't have attack multipliers. Fortresses also do a lot of damage but their energy consumption is enormous. Basically if you're going to use Fortresses you have to use Mark III Economical Command Stations to get as much Energy as possible. Otherwise you would have to run so many Matter Converters your economy would be completely wrecked. If you're going to build a Super Fortress or Mark III Fortresses I strongly recommend building the Zenith Power Generator. Which means you should have the Zenith Traders enabled. So Fortresses are very strong and a good choice. They're just a little bit niche because of their Energy consumption. Also Fortresses have a 0,01 damage multiplier vs Polycrystal which basically means they do no damage vs Bombers. This means you're going to have to unlock Turrets that counter Bombers to support the Fortresses. For this purpose I recommend the Lightning Turrets. -To one shot 200 Mark I Bombers every 17 seconds build at least 22 Mark II Lightning Turrets. That will result in a burst damage of 1584 hit points which is enough to one shot a Mark I Bomber. Of course you can just build full caps of all Turrets but that costs more energy. The point here is to minimize costs and maximize effectiveness. Note that all turrets have the same cap energy cost regardless of Mark level. 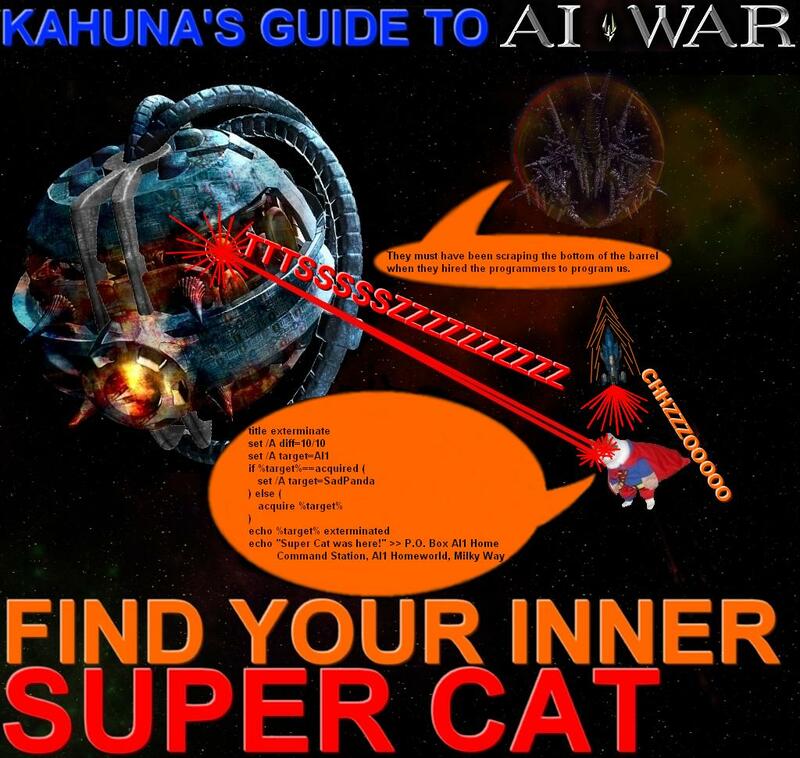 -On 10/10 difficulty the game starts with AIs having Mark II Tech Level. To one shot Mark II Bombers build at least a full cap of Mark III Lightning Turrets and 8 Mark II Lightning Turrets. That will result in a burst damage of 3168 hit points. -To one shot Mark III Bombers build at least full caps of Mark III and II Lightning Turrets and 11 Mark I Lightning Turrets. That will result in a burst damage of 4716 hit points. -To one shot Mark IV Bombers build at least full caps of Mark IV and III Lightning Turrets and 4 Mark II Lightning Turrets. That will result in a burst damage of 6336 hit points. -To one shot Mark V Bombers build at least full caps of Mark IV, III and II Lightning Turrets and 1 Mark I Lightning Turrets. That will result in a burst damage of 7812 hit points. Note that these calculations assume the Lightning Turrets are not protected by a force field. Also it's advisable to keep the Lightning Turrets in Stand Down Mode until the Bombers are in range. When they're in range disable the Stand Down Mode and start one shotting the Bombers. These screenshots are from a quick test game. Those waves are very small but I can tell it's so satisfying to watch when the AI sends thousands of Bombers and your Lightning Turrets just shred them to pieces. I also did some calculations about the cost effectiveness of Fortresses and Turrets. I only calculated the cost effectiveness of Laser Turrets but the cost effectiveness of the other Turrets is pretty much the same. Matter Converter produced 50.000 Energy and costs 200M/s. Fortresses, Turrets and Heavy Beam Cannons are all excellent choices. Which ones you should go for depends on your strategy, preference and situation. -If you're going to use Fortresses you're going to have to use Economical Command Stations and unlock something that counters Polycrystal (Bombers) like Lightning, Missile or Sniper Turrets. 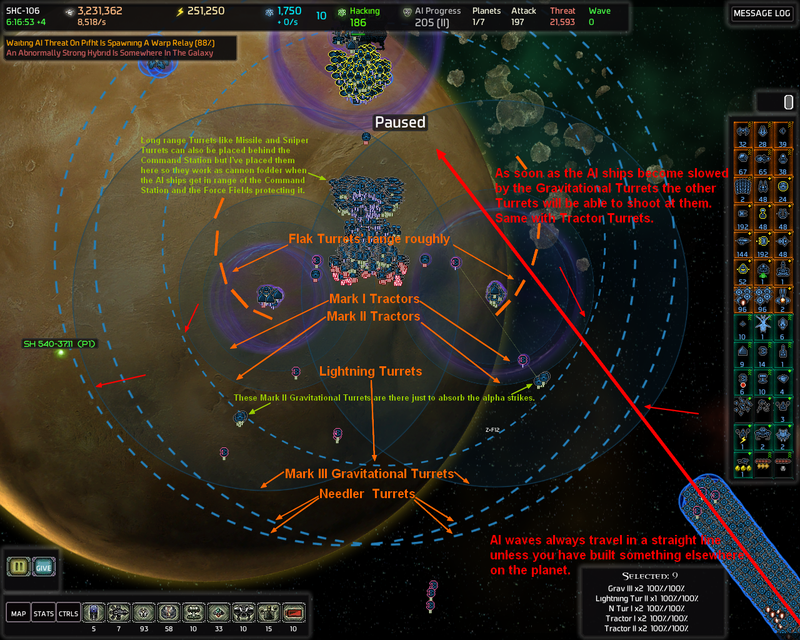 Also Fortresses are only for small/medium size empires (+-7 planets including Homeworld). For small/medium sized empires because Fortresses have galactic cap and large empires have "too many" planets connected to the AI planets so the player would run out of Fortresses. Of course you can do gate raiding but you can't really control where the CPAs and Exos come from. 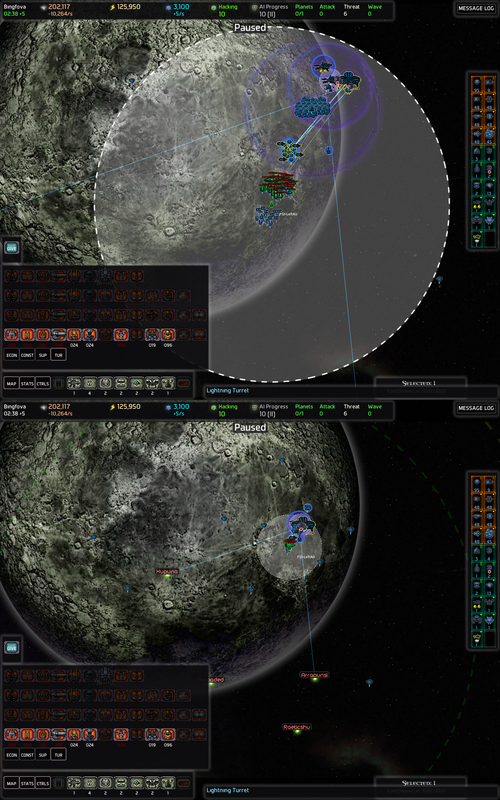 Fortresses are very good for creating chokepoints. -Heavy Beam Cannons work well with Military Command Stations. Heavy Beam Cannons' Energy consumption isn't going to wreck your economy so you can manage without Economical Command Stations. Like Fortresses they have a galactic cap so they're only for small/medium size empires and chokepoints. HBCs don't use attack multipliers so they're good vs everything. Mark IV HBC is an absolute beast. In short beachheading means attacking and building on an AI planet. Building Turrets, Fortresses or other some other (normally) defensive structures on an AI planet. To build stuff you don't need to own the planet. All you need is supply. And all of your Command Stations provide supply to all adjacent planets. Beachheading can also mean capturing an AI planet very rapidly by just destroying the AI Command Station and building your own without even trying to destroy the Guard Posts or other AI structures. Just destroy the AI Command Station, build your own and then build turrets. This kind of beachheading allows you to beachhead planets much further than 1 hop away from your planets. You can even deep strike 6 hops and then do this. As soon as you destroy the AI Command Station it's no longer considered as deep striking so the AI will stop gathering threat. 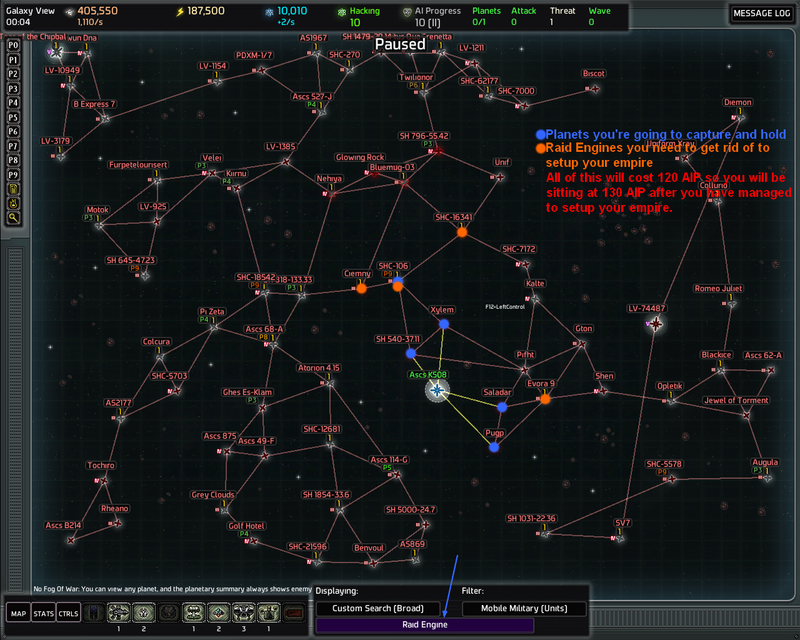 So you don't have to capture every planet on your way to AI homeworlds. A planet every 6 hops is enough. 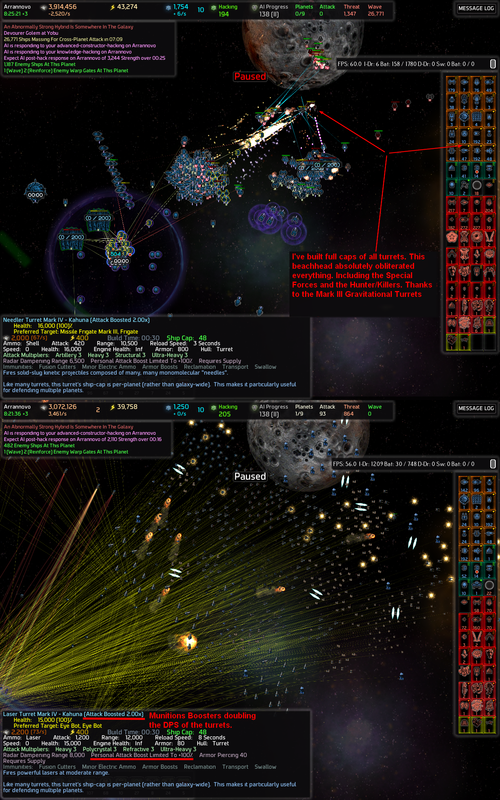 Assault Transports attrition 26% of their life when going trough a wormhole without supply. This means fourth non supply hop will destroy it. Since your Command Stations provide supply to all adjacent planets it will be the fifth hop that will destroy the Assault Transport if you leave from one of your planets. So if you have a planet in both ends the Assault Transport can travel 6 hops without being destroyed. This means capturing a planet every 6 hops is enough.. which means you don't need to increase the AIP as much. Which is obviously very important. On high difficulty levels you need to take every advantage you can get. This is why I love turrets and Munitions Boosters. Turrets can be used for defense and offense and Munitions Boosters double the firepower of all turrets (Turrets' attack damage boost is capped at +100%). Which means even more bang per buck. If you don't want to choose Munitions Boosters as you bonus ship you can also use Flagships or Military Command Stations for that purpose. Also don't forget that you can also include Space Docks and even Starship Constructors into your beachheads. Building a Space Dock there allows you to reinforce the beachhead as fast as possible. Offensive beachheading means hacking or taking out a target by primarily using the firepower of turrets or other defensive structures. It's a very good alternative for simply attacking with your fleet. Often it's done in addition to attacking with your fleet. Here's an example of offensive beachheading. Here my goal is to clear the planet so I can capture it. And as you can see in this screenshot.. or a compilation of screenshots.. ..I have not destroyed any AI structures. All the Guard Posts and the Ion Cannons are still there. Also the AI Command Station. But it's no problem. You don't need to care about them. Just go in, build turrets and let the turrets take care of the guarding AI ships. Turrets are much more cost effective than ships so they will do the job much better than ships. Turrets do more damage, they're cheaper and they can be rebuilt by Remain Rebuilders in middle of combat. Just build a Force Field to protect the Rebuilders and Engineers and you're good. It's very effective. The screenshot compilation above should be pretty much self explanatory. Just get a lot of Engineers so you can pretty much "insta build" everything. Put your whole fleet, at least 5 Mobile Rebuilders and as many Engineers and Rebuilders as possible into Assault Transports. Then unload them in an area that's out of Guard Posts' range. Start by building a Force Field to protect the Engineers and Rebuilders so you can keep building/rebuilding as long as possible. Here's another example of offensive beachheading. Here I'm about to hack the Advanced Factory. All AI planets with an advanced constructor are classified as important planets by the AI so the AI Special Forces will defend those planets. All advanced constructor planets have a B-class Core Shield Generator if they're enabled. Advanced Research Station planets have A-class CSG. They're also protected by the Special Forces. So this beachhead had to be especially strong or the Special Forces would have the floor with it. Here's an extreme example of hacking (and offensive beachheading). Hacking like a man.. or should i say.. Super Cat. The image is ~30mb and it's quite big "physically" too so you might wanna download it or open it in a new tab/window. I hacked the Super Terminal for 248 AIP reduction which means 124 net AIP reduction since the Super Terminal decreases the AIP by 2 and increases it by 1 at every tick. 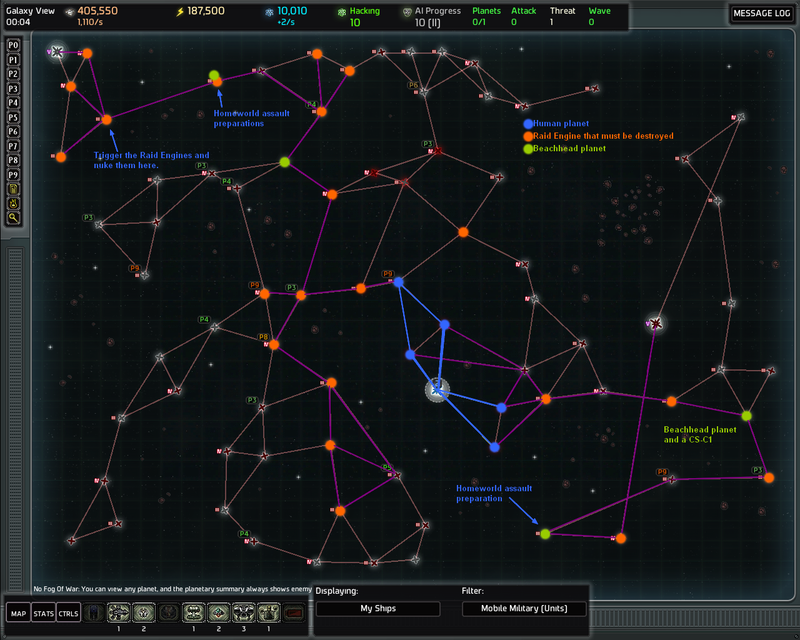 The Super Terminal spawned over 505k strength when it died which resulted in a total of ~417k ships. I knew this would happen so I was prepared with a Mark I Nuclear Warhead. Note that detonating a Mark I Nuclear Warhead increases the AIP by 50. After the nuke there was still over 6000 Mark V fleet ships left in addition to the ~100 Mark V Raider, Spider, Missile and Tractor Guardians. I destroyed majority of the Guardians with few Lightning Warheads and my defenses killed the rest. Before I started the hack AIP was at 282. After hacking the Super Terminal, nuking the 417k ships and stopping the Mark V Ships and the Guardians AIP is at 212. So in the end the net AIP reduction was 70 which was a really good deal. If I had more hacking points available I might have been able to get over 100 net AIP reduction which could have been borderline overpowered. A pretty extreme example but it really shows you the power of beachheading. Defensive beachheading means adding an additional layer to your defenses to further delay and whittle down AI's attacks like CPAs and Exos. Defensive beachheads will also keep threat low. They will prevent threat from gathering on your door step. However they will consume quite a bit of metal and energy. This is a pretty extreme example of a defensive beachhead but if you're really afraid of those CPAs or Exos this is what you can do. Build one of these in front of every whipping boy and ooohh buddy.. the AI's attack forces will be having a really bad day. As you can see there's well over 700 turrets so if you're going to build multiple beachheads like that you're going to need those Mark III Economical Command Stations. Otherwise you would have to run dozens of Matter Converters which would most likely wreck your economy. Here are some save files at different stages of the game so you can take a look at what I've done so you can "study" it and maybe get some ideas. I'm also going to explain what I've done so you can try and copy it. I'm pretty sure if you are able to copy and understand what I've done here you will be able to win 9/9 difficulty. Or at least get there faster. -The beginning of the game at 00:01 in-game time so you can play the exact same game. Exactly the same settings. -The beginning of the game at 00:01 but with complete visibility. -The current situation at 2:49:46. I've edited the save files to remove Zenith Siege Engine unlocks from the AI. AI sending 500 Mark II Zenith Siege Engines was a bit cheesy to say the least. There's no way in hell you're going to stop them before they one shot your Command Station. EDIT: Actually I'm going to detonate a Mark II Nuclear Warhead next to the upper AI Core planets.. on the planet where I was going to trigger the Raid Engines and then nuke the ships. It will cost 500 AIP so I'm going to get rid of the other AI Homeworld first. Also before detonating the Mark II Nuke I'm going to gate raid all Warp Gates so all waves "become CPAs".. this way I can just nuke the incoming waves on the planets next to my whipping boys. If I can actually get that far in the first place of course. Pause as soon as the game starts. Always pause unless you're doing something or waiting for something. Configure the global controls, unlock possible economical technologies immediately to maximize the metal income. In this game we're not going to unlock economical technology right away. We're going to use the Raid Engines to our advantage.. that's right. Early game we're going to trigger some Raid Engines on purpose to get some salvage. You should be careful late game though as Raid Engine waves can easily be over 5000 ships. Triggering a couple of them at once is comparable to a CPA. Especially brutal if the Raid Engines are on Mark IV planets..
..Now you need defenses. I prefer building Turrets before fleet ships because they're more durable and do more damage. In this game I chose Munitions Boosters as my bonus ship so I can use them to double the firepower of my turrets. Helps tremendously on offense too. Unlock Assault Transports, Mark II Munitions Boosters and Mark II Needler Turrets. Turrets' attack boost is limited to +100%. Mark I Munitions Boosters boost by +80% and Mark IIs boost by +110%. A cap of Mark II Munitions Boosters can boost hundreds Turrets to +100%. In other words the turrets will do double damage. Build 10 additional Engineers and 5 Rebuilders. 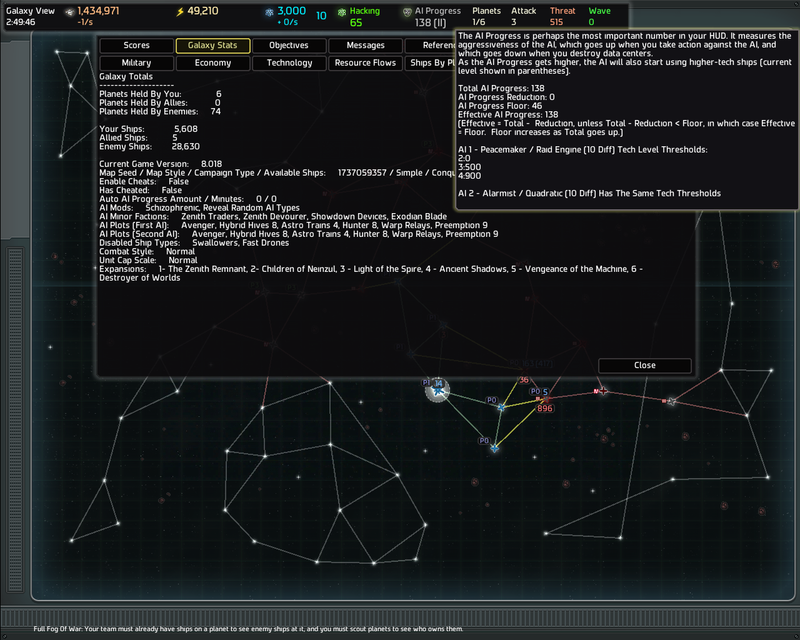 Build 3 additional Force Fields to protect the Home Command Station, the Settlements and the Cryogenic Pods. Then build Mark II and I Munitions boosters and turrets. All of this above should be done at once while the game is paused. Right at the beginning at 00:01 in-game time. Then build all other turrets. The problem when playing against the Raid Engine AI type is that the AIP will skyrocket very fast. Especially early game. The problem lies in being able to setup your empire before you die. That's not all though.. after that you must be able to push deeper into the galaxy to find AIP Reducers. Which means dealing with more Raid Engines. Which means AIP gets ever higher and the Raid Engine waves start to become extremely brutal. The game starts at 10 AIP so just destroying one Raid Engine increases the AIP by 50%. That's why you have to be fast and furious and have strong defenses so you can turn those Raid Engines into Salvage Engines. When wave sizes get well over 1000 you need to start unlocking additional Needler and Laser Turrets to counter the Carriers (they have Heavy hull type). 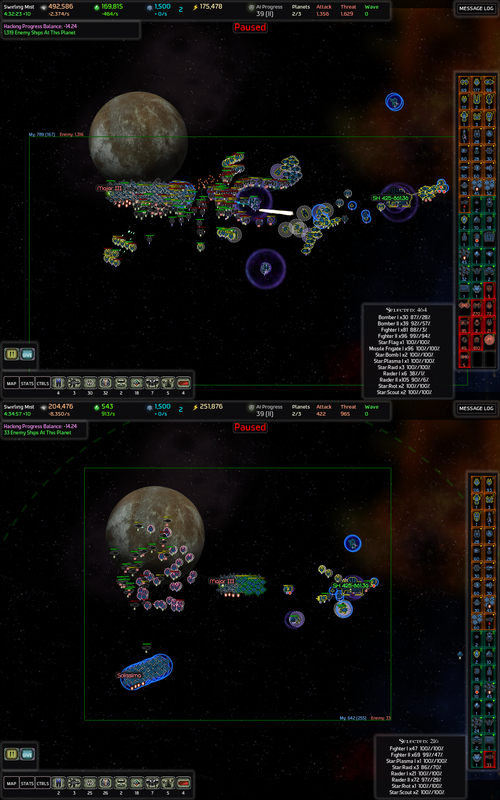 You will also need Laser and Missile Turrets to deal with the bombers swarms and blobs of Spire and Zenith Starships. At this point it's also good to have Mark III Gravitational Turrets. They help tremendously. They will buy you a lot of time to wear down those Carriers and Starships (and everything else obviously) before they get in range of your Command Stations. So now you have setup your homeworld. Now you need to start destroying some of those Raid Engines so you can capture more planets. First you should capture SH 540-37.11 and Xylem. Then SHC-106 and then Pugp and Saladar. Later into the game you should consider setuping permanent beachheads in Pifht and Evora 9. SH 540-37.11, Xylem, Pugp and Saladar Command Stations should be build right next to the AscsK508 wormhole. They will work as a buffer planets against CPAs and other attacks. SHC-106 is going to be a "brick wall" with Trader toys such as Planetary Armor Booster, Radar Jammer II and Orbital Mass Drivers (which are extremely powerful vs Carriers btw). Good thing AI 1 is Peacemaker/RaidEngine so you can get the Orbital Mass Driver for free. To capture SH 540-37.11 and Xylem you need to destroy the Raid Engine in SHC-106. You should also destroy the ones in Ciemny and SHC-16341 because the AIP is still low so dealing with the waves is much easier. Also you will get the salvage so you don't have to just sit and wait as much. First send an Assault Transport with Mark I Fighters and half of the Munitions Boosters to get rid of the Tachyon Sentinels that get in your way. Then send an Assault Transport with Mark I Bombers and Munitions Boosters to destroy the Raid Engine. Keep the Assault Transports in stand down mode (press K). When you're next to the target pause-->unload-->unpause-->pause-->order the unloaded ships to attack the target and then waypoint back into the Assault Transport. Do this to all of the 3 Raid Engines. It's good to keep some Mark II Munitions Boosters back at home to boost the turrets. After you have destroyed the Raid Engines you can start working on SH 540-37.11 and Xylem. And again.. you need to be fast and furious so you're gonna wanna destroy and capture SH 540-37.11 and Xylem pretty much at the same time. Build 10 Mark II Science Labs. 5 for both of the planets so you get the Knowledge as soon as possible so you can get more tech unlocks to compensate for the AIP increase. So send 5 Science Labs to each planet. Build 2 Assault Transports if you don't have already. Split your whole fleet into the Assault Transports and use the Assault Transports to destroy the Command Station. Again.. keep the Assault Transports in stand down mode until you're next to the target. Then destroy the Command Stations and unload the ships if you think you can win the fight. By fight I mean destroying the guarding AI ships. Ignore the Guard Posts. If not the capture one planet at a time. Attack with your whole fleet and beachhead if you have to. Build a lot of Engineers and Rebuilders and a Colony ship for each planet. Send half of them to the other planet and the other half to the other planet. Build your Command Station and a Force Field to protect it. Build Sniper Turrets first so they can start working on those remaining Guard Posts. You may or may not have to manually target them. Build Minefields and all other turrets. It may be a good idea to not build literally all turrets at the same time or you might run out of resources. Build Sniper and Missile Turrets first. Then Needler and Laser Turrets. And then MRLS, Lightning and Flak Turrets etc. Now you can start working on SHC-106. Note that SHC-106 has a Core Shield Generator. That means Special Forces will come to defend that planet. This early in the game the Special Forces aren't that strong so a strong beachhead should be able to handle the Special Forces too. Note that the Hunter plot is set to 9/9 which makes Special Forces a lot stronger. Also at this point in the game Hybrids will start massing up so beachheading is a good idea for that reason alone. But first you need to get rid of those Ion Cannons or they will shred your beachhead to pieces. Turrets destroyed by Ion Cannons leave no remains. Build a cap of Mark I Raid Starships and put them with Fighters into an Assault Transport. Send the Assault Transport to SHC-106 and destroy the Ion Cannon in north east next to the Special Forces Guard Post with the Assault Transport. Put the Assault Transport into stand down mode and wait until it has become invisible. Now move it next to the other Ion Cannons and again pause-->unload-->unpause-->pause-->order the unloaded ships to attack the target and then waypoint back into the Assault Transport. You will probably lose all of the ships but it's ok as long as you got rid of the Ion Cannons. Now put your whole fleet into Assault Transports with 30 Mark II and 20 Mark I Engineers, 20 Rebuilders, 5 Mobile Builders and some Mark II Science Labs. Unload all ships to north side of the gravity well. Immediately start building a Force Field to protect the Engineers. Then build Needler Turrets to deal with the Hybrids and then Sniper and Missile Turrets. Laser and/or MRLS turrets next if needed. When it looks safe build your Command Station next to the Xylem Wormhole and the Orbital Mass Driver. Fortify the planet. Now you should be roughly where the "Autosave - In-game time_00_56_22.sav" is at.. I recently started a couple of AARs (after action reports) and some people found them informative and helpful so I thought it's a good idea to add link to them here. In my AARs my goal is to always explain what I'm doing and why. What's the rationale, how it's going to benefit me and how am I going to execute it strategically/tactically in practice. I've also attached the save files to the AARs so you can try to play it yourself or just check it out if you want to see it in-game. Operation Cryptonite (10 Raid Engine / Vengeful // 10 Artillerist / Vorpal) - Failed (but good) attempt. Alarming Vengefulness (10 Raid Engine / Vengeful // 10 Vanguard / Alarmist) - Won this one! I'm looking forward to how this turns out. I also ended up enabling everything under the sun, then immediately disabling it all when I realized I was A) out of my depth and B) had no way of telling what settings would be suitable for me. Here's to hoping that part of the design of this strat guide is a collection of settings aimed at the "brave newbie," who is not afraid of a challenge, but would prefer to have as much of the AI War expansion pie as possible for his first several games, but without being reduced to a smear six hours in. FYI to the readers: I had asked Kahuna to rope these topics together so I could link them from the tip-of-the-day thing, though I think he was planning on compiling them here at some point anyway. Yep. That's why I recommended enabling stuff like Hybrids, Wardens, NRC and Miners BUT setting them to 1/10 or 2/10. So the player sees them in action without getting obliterated. The best way to learn is to just try stuff. And.. that's also why I recommended disabling the nasty ones like Astro Trains, Human Colony Rebellions, Fallen Spire Civilian Leaders, Cookie Monster. All of those have nasty, inevitable and permanent effects on the game. Advanced Hybrids can be stopped but that's advanced stuff and to be honest.. finding the Dyson Antagonizer and other stuff can be a bit tedious. I with there was a signal tracker or something. though I think he was planning on compiling them here at some point anyway. And no problem! ^^ This is the kind of information I was looking for when I was new to AI War but there were no guides so I had to figure out everything myself. I recommend un-recommending shield ninny, just because that makes attacking mind-numbingly repetitious. You can encounter, say, polycrystal-countering turrets under mark III force fields that's covered by a fortress and then you're just like... um. Or idk, I guess you could right click it and watch it die but I'm not such a fan of that when it comes with massive losses. Well then you would either go around the planet or beachhead the planet and destroy the Fortress and the Force Fields with Mark II and/or Mark III Needler Turrets..
Well I mean those aren't particularly basic first-game tactics. Great advice. The mine stuff in particular is really useful. I never knew how awesome mines were until recently. One thing I did find is that when doing the line placement, I had to be careful of how densely it wants to pack them because I was running out of mines really quickly. Yep. Start by placing 3 lines of 15 Minefields. So 45 Minefields/Wormhole. Add more later. Sorry, where is that menu for In-game controls located? @origami: Is this what you're after? ESC--->View Controls or ESC-->Settings-->View Controls but the first one is faster of course. You can access the In-Game Controls by pressing the "CTRLS" button near bottom left corner. @Kahuna: Nice work! 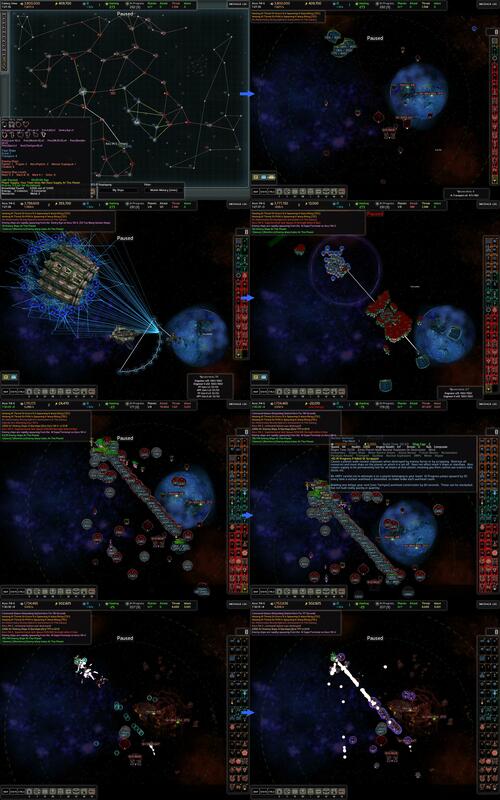 I've added a link from http://www.arcengames.com/mediawiki/index.php?title=AI_War:Fleet_Command#Player-Created_Strategy_Resources so players can find this. Out of curiousity, why do you recommend enabling schizophrenic waves? I get that it's an advantage at high-level play, but perhaps newbies would learn the different ships and how to counter them better facing homogenous waves? Thanks, I don't know why I was looking for those control settings under View Controls. Kahuna, can you please finish the beachhead section? Was waiting for the next installment. Perhaps the AI's counter-intelligence agents have been active. I was going to start playing AI War again this weekend and maybe keep writing this. I still haven't finished my latest 10/10 game. It's version 7.001. Basically I just need to attack the AI Homeworlds and finish the game but I've been too busy. Yes you can say that.